This chapter is based on the work by Per Redelius of Nynas Bitumen which appeared in Chapter 9 of the second edition of the Handbook. His data are reproduced by permission. It is very easy to take bitumen (usually called asphalt in the US) for granted. It’s just black sticky stuff that comes from oil. That’s true till your life depends on it. Road safety depends strongly on the qualities of the road surface which in turn depends on the subtle details of the bitumen used to make it. More sophisticated road surfaces use bitumen that has been modified with polymers. It is important to know the compatibility between the bitumen and the polymer. Bitumen is produced by distillation from crude oils and its properties can vary widely depending on the crude oil used. Unfortunately it is exceedingly difficult to analyse. And because it is so black and viscous, it is hard to know whether, for example, you have a solution or a dispersion when you add a polymer to the bitumen. And of course whether it is dissolved or dispersed makes a big difference to the ultimate properties of the bitumen and the road surface. We know that a thermodynamic definition of “compatibility” is provided by HSP. So if we know the spheres of the bitumen and the polymer we can calculate how much they overlap. If the overlap is strong we can be confident of compatibility. If the overlap is small then compatibility will be unlikely. Well, actually, it’s not quite that simple. It’s very hard to know if you’ve got a perfect solution or if there are some bits or if it’s merely swollen or... A Yes/No solubility test is rather hard to apply. So you can score the solubility from 1-6 where 1 means that there’s not the slightest residue if you filter the solution to 6 which means there’s not a hint of colour in the liquid. You then need to define what you mean by “good” or, in the language of HSPiP “Inside” the Sphere. If you’re really careful, you’ll define “Inside” as “1”. Or you might be interested in “good enough to be inside” so define “good enough” as “3”. This brings in the crucial question of subjectivity in HSP calculations. How can I tell the difference between a score of 2 and a score of 3? How worried should I be about a mis-scoring? The good news is that the software lets you try out the effects of allowing different scores to be classed as “Inside”. With this particular bitumen, the variation in parameters between 1 & 2 is not all that great. When you admit 3’s as “Inside” then the radius (not surprisingly) increases. The plot below (based on a generic bitumen) uses a 0-15 scale for P and H to provide a more detailed view for this and subsequent plots. So now we can start looking at different polymers. If we try polyether sulfone we find that the spheres are highly distinct – so it is unlikely that the polymer will be anything other than a dispersed solid when mixed with the bitumen. 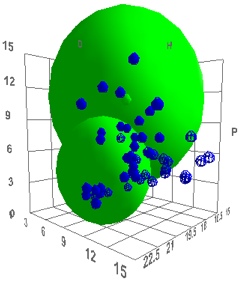 To get this plot, open the Polymer form and enter the Bitumen data as the last item. Select Bitumen and also select Polyethersulfone. 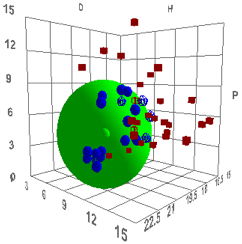 Then click Solvents and the two polymers and the solvents are plotted for you. A plot comparing bitumen with Styrene-Butadiene block co-polymer (SBS) is more interesting because SBS is the key polymer used with bitumen in road construction. It shows significant overlap but a significant part of the SBS is outside the bitumen. Given that SBS has two very distinct polymeric components it is interesting to note that if you compare polystyrene with polybutadiene you see that they are not very mutually compatible – which is why SBS is an “interesting” polymer. And if you calculate the overlaps between bitumen, polystyrene and polybutadiene you find that they have similar degrees of overlap. The SBS must neither be fully compatible nor fully non-compatible. The HSP of the bitumen must be such that the appropriate marginal compatibility is achieved for optimum performance at both high and low temperatures. 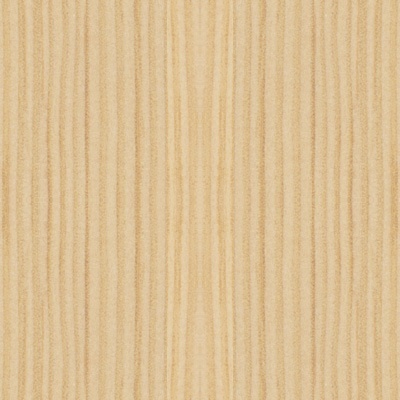 With an extensive table of polymer HSP it should be easy to find polymers with a strong match of bitumen. This is easy to do within the program. If you double-click on bitumen, the polymers in the table are sorted with respect to their double-overlap with bitumen. Double-overlap? 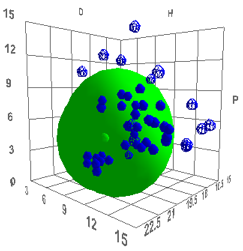 Yes, you have to report two figures – how much the bitumen sphere overlaps with the polymer sphere, and vice versa. For example, if Polymer A is a small sphere that is completely inside Polymer B, its overlap score is 100%. But because Polymer B’s sphere is so much larger, it is overlapped by only a small % by Polymer A, so the score is, say, 20%. 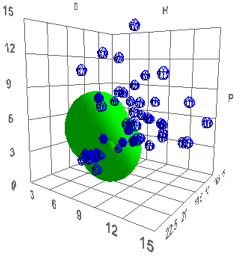 Thus the combined overlap is shown as 120 100/20. Without this double-overlap score it is easy to jump to the wrong conclusion about the mutual overlap of spheres. Here is what you see on the screen. 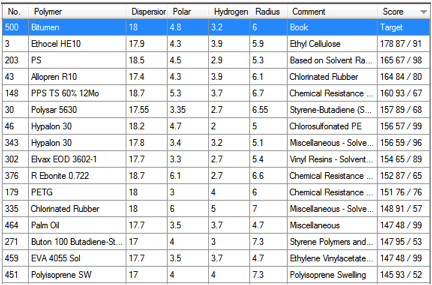 It is interesting to note that near the top of the list are two styrene polymers – just as you would expect from the previous discussion. Whether you would want to use Hypalon 30 in your bitumen, only you can tell – but you could be confident that it would be highly compatible. In summary, HSP have brought light to a very black subject. With just a few experiments you can know where to look for interesting compatibilities or incompatibilities with polymers and have a high degree of confidence that when you mix them you will have results along the lines you expect. This is a far more elegant approach than experimenting in the dark. Another form of black material is carbon. Like all pigments/fibres it is insoluble so the “S” in HSP certainly doesn’t apply – or does it?